The Middle Fork of the American River is a true wilderness rafting experience, secluded timeless beauty full of human history from the Gold Rush era along with some of the biggest rapids rafted in California, including the ultimate in “Big Drops” at the Tunnel Chute Rapid. This stunning 18 mile section of Middle Fork of the American River was pioneered by American Whitewater Expeditions back in the 1970’s and even today, we are leading the way and setting the standard. Thanks to Jason for putting together this video after his trip! Ready to Go? Choose your trip and reserve your spot today! 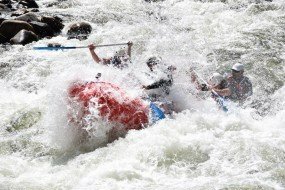 The Class IV Middle Fork rafting trip is an intermediate whitewater river featuring big drops, tons of action and intricate maneuvers. This is an ideal rafting trip for adventurous first timers and those who have rafted the South Fork before but who want even more action, seclusion and beauty. There is a minimum age of 12 and the trip requires all participants to paddle. With a professional guide steering your raft, you will have an extraordinary day of whitewater rafting on this world-class river. Between the big drops and fun rapids there are long calm pools where you will get to take in the sheer beauty of the 2000 foot wilderness canyon that you’re rafting through. You’ll stop halfway for a yummy riverside lunch before getting on the water for more whitewater action. There is a lot of wildlife in the canyon from eagles to river otters and even the occasional bear in the blackberry bushes! Your Middle Fork rafting trip will take you down the ultimate in “Big Drops” at the Tunnel Chute Rapid. Here the river descends 80 feet through a very narrow chute that is at most 18 feet wide! Then you’ll suddenly find yourself underground for 90 feet traveling through a tunnel blasted by the gold miners long ago. This is a truly memorable rafting trip and every year our guests keep coming back for more. We offer 6 different American River rafting experiences, ranging from one day to multi day trips. You can combine a Middle Fork rafting trip with the South Fork or North Fork for a truly exhilarating and unforgettable multi-day rafting adventure. When is the best time to go rafting on the Middle Fork? The Middle Fork rafting season starts early May and we sometime run it in April depending on several natural factors. The Middle Fork of the American River is dam controlled and offers stable and exciting flows all summer long. Early spring trips in April and May can sometimes have slightly higher water levels if there are heavy rains and excessive snowmelt. You can raft the Middle Fork all the way until the weekend after Labor Day. Where is the Middle Fork Located and where do we meet for the trip? The Middle Fork of the American River is located 30 minutes from Auburn, 50 miles North East of Sacramento and only 140 miles East of San Francisco. There are a few meeting options for the Middle Fork rafting trip. So you can pick the one that suits you best. Option 1: Stay at our deluxe campground in the Historic Gold Rush town of Coloma the night before your trip. Your camping the night before is free! Option 2: By prior arrangement, you can meet at our Auburn Meeting area at 9:00 AM the morning of your trip. Leave your vehicle at the secure parking area and ride our shuttle to the river. At the end of your trip, you’ll be dropped back at your vehicle. This is a great option for those of you coming from near Sacramento, Reno or the Bay Area. Option 3: Meet at our Camp in Coloma at 7:00 AM the morning of your trip. Ideal for those living off the I-50 Corridor of Sacramento or driving down from South Lake Tahoe. Want to stay a while? There is a lot to do and see in Coloma and the surrounding areas, so why not take a few days. Our location and facilities are truly unique. We are the only rafting company with easy river access that has a privately owned resort campground with great facilities like an in ground swimming pool, stocked bass and trout pond, luxury cabins and lush grass covered campsites. Our private campground in Coloma is located in the middle of the Marshall Gold Discovery State Historic Park. Just a five minute walk and you are in the middle of Gold Rush History! Coloma is in the heart of El Dorado Wine Country and surrounded by beautiful Hiking, Biking and Equestrian Trails. So are you ready to spend a day rafting on the Middle Fork and having more fun than a barrel of monkeys? Check out the Middle Fork American River virtual tour with a rapid-by-rapid description. California State Parks has an excellent site with lots of information about the Middle Fork of the American River and the surrounding area. There is also Middle Fork American River Access Map for people interested in exploring the Middle Fork American River. You can also look at current and historic Middle Fork Flows. Photos are taken at Tunnel Chute Rapid and are available online after your trip. For more questions on our Middle Fork Trips or questions in general, please call us at 800-825-3205 or check out FAQ page. GO BIG….then go home! Go big through the world-class drops on the Class IV Middle Fork. Spend the next morning splashing down continuous whitewater on the South Fork Chili Bar Run. Perfect for those who need to GO BIG and then head home after lunch on the second day. Our most popular Middle Fork Rafting two day trip! Warm up on the fun rapids of the South Fork and then head to the Middle Fork for an even more intense run surrounded by breathtaking scenery. If you want maximum river miles in two days than this trip is for you. Spend all day on the fun rapids of the South Fork learning the ropes and then step it up on the Middle Fork showing off your paddle skills. Double your fun with 18 miles on the Middle Fork each day for a total of 36 river miles. Even on the second days run its like being on a new river. This is a Middle Fork rafting adventure you will long remember with lots of river time. Go home refreshed, invigorated, smiling and relaxed! Enjoy three relaxing days on the river and nights under the stars. A perfect way to get away from it all and re-charge.